Ali Mohammed, Ethiopian Airlines area manager Gulf, receives the award. Ethiopian Airlines, the largest aviation group in Africa and Skytrax-certified four-star global airline, has won the Aviation 100 “Africa Lease Deal of the Year 2018” award by Airline Economics Magazine during the Airline Economics Growth Frontiers Dubai 2018 conference gala dinner. 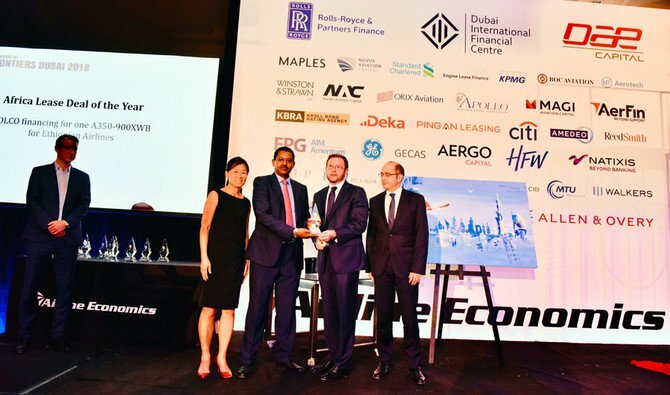 The Aviation 100 awards recognize aviation’s most outstanding performers, as well as the most innovative and successful finance and leasing deals closed in the last 12 months. Winners of the Aviation 100 awards are decided by an industry-wide survey, a rigorous vetting process and editorial consideration.